Director/Screenplay – Mark Jones, Producer – Jeffrey B. Mallian, Photography – Levie Isaacks, Music – Kevin Kiner, Special Effects – Players Special Effects, Special Effects Animation – Michael Hyatt, Makeup Effects – Atlantic West Effects (Supervisor – Gabe Bartalos), Production Design – Naomi Slodki. Production Company – Trimark Pictures. J.D. Redding and his daughter Tory move into a cottage in the country. Unknown to them, the previous owner had taken the pot of gold belonging to a leprechaun and then trapped the leprechaun in a crate in the cellar, imprisoning it with a four-leaf clover. During renovations, the four-leaf clover is unwittingly knocked off the crate, releasing the leprechaun. The leprechaun then starts slaughtering all those around in its attempt to retrieve its pot of gold. 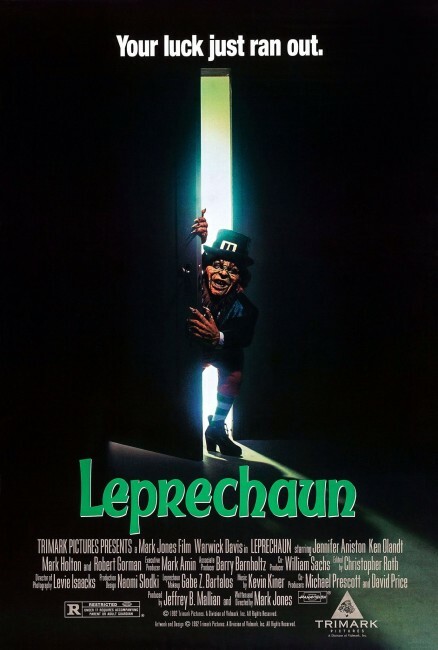 Leprechaun could be considered a horror movie version of Finian’s Rainbow (1968) – imagine if you will a cross between Finian’s Rainbow and an A Nightmare on Elm Street sequel. The film is clearly another attempt to create an Elm Street franchise with a punning comic-book boogey man creatively slaughtering cast members accompanied by bad puns. To such wit, Leprechaun has so far spawned five sequels. Leprechaun became a laughing stock upon its release. In its defence, it is so cartoonishly silly that it is hard to take much offence. It is conducted with an inordinate amount of absurdly brainless energy. Warwick Davis gets into the title role with considerable relish. The female lead is played by Jennifer Aniston just before she went on to superstardom on tv’s Friends (1994-2004), married Brad Pitt and became a top-selling magazine covergirl. Six sequels were made to the film:– Leprechaun 2/One Wedding and Lots of Funerals (1994), Leprechaun 3 (1995), Leprechaun 4: Leprechaun in Space (1996), Leprechaun in the Hood (2000), Leprechaun: Back 2 tha Hood (2003), Leprechaun: Origins (2014) and Leprechaun Returns (2018). Warwick Davis also played a leprechaun in A Very Unlucky Leprechaun (1998), which should not be confused with the entries in this series. Director Mark Jones went onto make a further horror film about a pint-sized mythological character with Rumpelstiltskin (1996) and in the horror genre also made the split personality psycho-thriller Quiet Kill/Nightmare Boulevard (2004) and the killer ventriloquist dummy film Triloquist (2008). Jones has worked as a scriptwriter on television, frequently animated series, in particular as story editor on The A-Team (1983-7).